I love dhows. They embody a grace and a beauty that is simply unsurpassed by any other sailing vessel. The origin of the word “dhow” is heavily disputed, but is used to describe a variety of wooden boats differing not only in size, but also design. The dhow has become a symbol for Arab culture and trade, yet its origins are obscured by the mists of time. For centuries they have been plying the oceans with the help of the monsoon winds, carrying merchandise that were traded along the coasts of East Africa, India, Bangladesh, Pakistan, the Arabian Peninsula, and even as far as China. Most dhows with home ports in Oman and the Persian Gulf used to set off for East Africa between mid-November and the end of February. Dhows that set out earlier would have experienced light, unreliable breezes, but as the monsoon set in, the journey time would have been shortened considerably. Most dhows would then start the return journey between the beginning of April and the middle of May. From Africa they carried skins, ivory, shells, wood, coconuts and coconut products, as well as maize and other grains, cloves and slaves. The cargo from Somalia included cattle, goats, sheep, ghee, tallow, gum arabic and shark fins. From Arabia they carried salt, salt and dry fish, dates. From Iran salt, dates, carpets, nuts and water pots and from India mats, pots and ‘Mangalore’ tiles. 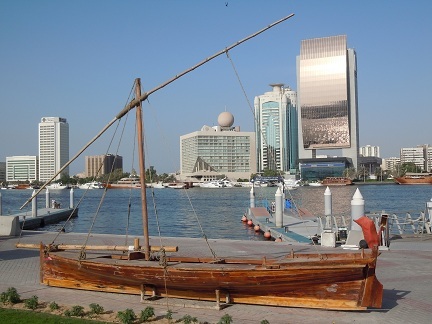 Dhows still play a major role in the modern economy of the UAE. Loaded with merchandise, they regularly leave the Dubai creek on route to Iran. They are also still used for fishing and more and more for the purpose of tourism. 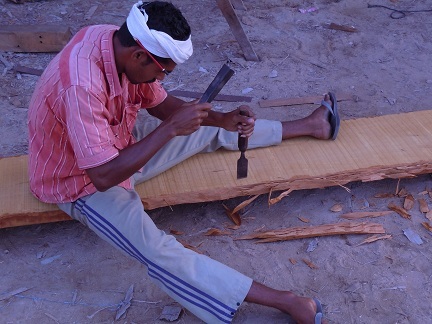 Dhows have always been predominantly made from Indian teak and had lifespans of about 50 years. They are solid and sturdy wooden boats that are still crafted by hand and rudimentary tools. Building one of these vessels requires hard physical labour and dexterous hands. No blueprints are used and knowledge and skills are transferred from one generation to the next. Dhow building areas are still scattered around the Gulf in sheltered creeks or bays. One such boat building station can be found in Ras-al-Khaimah (GPS: N25o49’ 19.29” E55o58’ 31.09”). Here a handful of labourers toil away at a task that will take many months, if not years to complete. Beautiful white triangular or lateen sails have powered these boats on their journeys, yet today the sails have been replaced by engines. A variety of dhows with a confusing jumble of names (and spellings thereof) include the following different types: baghala, batil, baqarah, sashe, sambuq, bum, shu’ai, jalibut. 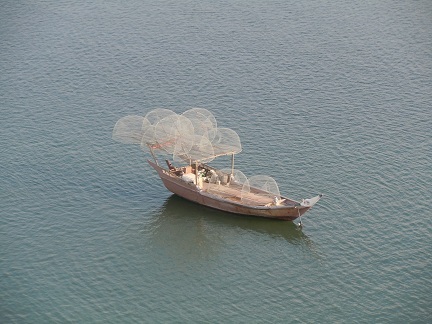 The shu’ai (picture below) is one of the most common types of dhow in the Gulf and is mainly used for fishing and trading. This particular design can vary from five or six metres up to boats fifteen meters in length. It has a distinctive profile: high at the stern and sweeping low towards the bow before rising to a characteristic jutting prow. The jalibut (picture below) is a small to medium-size boat with a straight keel and squared transom with an almost upright prow. It has been used extensively in the past as pearling vessels, but also for fishing and transporting goods. Watch the launching of a dhow in Ras-al-Khaimah on the following link. Great writing and pix Jolandi and a rare insight into fascinating places. Oh how I miss the Emirates! It is a lovely corner of the world. Did you use to live in the Emirates, Amrita? No, but I have an unshakeable obsession with all corners of the Middle East. I have visited the highly commercialized hub of Dubai though before. Well, then you haven’t been to the UAE yet. 😉 You should come back for another visit. There are so many beautiful corners to explore far away from all the artificial glitz, which I may add, is also great to experience. Inshallah 😉 It seems you have covered the Emirates quite extensively! I also see you are a writer – I think I’ll live my dream vicariously through you for now. Ah, there is still so much more to see and do, but for now, I hope you will enjoy my experiences in the UAE as much as I do. That is why I enjoy blogging, and reading other blogs, as it gives one access to experiences and destinations that otherwise we won’t have. HI, I love all the interesting aspects of dhows you have shared with us, thank you! I would like to know where you find your information as I would love to research more on this topic. I have visited the museums but there is not much information and it is not as detailed as you describe. Could you kindly provide references, or names of books that could guide me further on the history of the UAE?